Like the ubiquitous Beef and Broccoli, exactly where, when and how Crispy Chilli Beef came into existence remains as intriguing and mysterious as Josh Hartnett’s gaze circa Pearl Harbour. 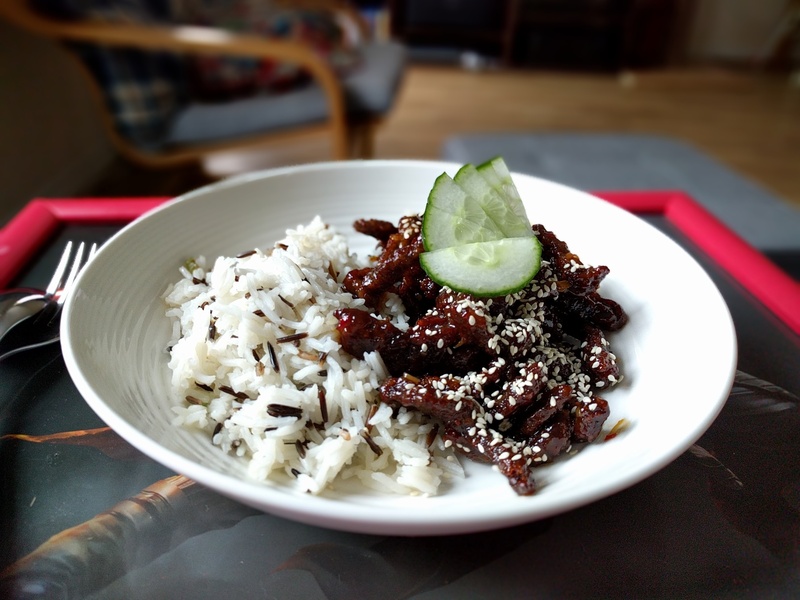 I like to imagine that an enterprising Chinese cook – preferably a diminutive elderly man – concocted the recipe in his suburban takeaway to enthral his Western customers’ tastebuds with an irresistible combination of a crispy bite and a spicy, sour, and syrupy sauce. Even though its origins are fuzzy, we’re very proud to stand by CCB as a Chinese classic. Sure, it may be more of a ‘once in a while’ kind of dish, but it is genuinely something worth treating yourself to because it is off-the-charts tasty. Besides, we all need a treat once in a while and here at the Dumpling household we believe that no food is ‘bad’ food – it’s all about moderation, being active and eating what makes you happy. 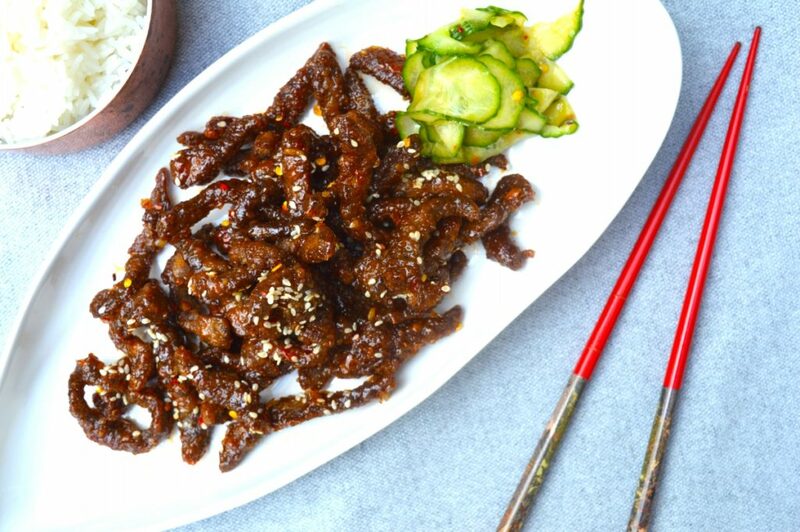 Today we’re sharing our own recipe for crispy chilli beef and we hope you’ll be pleasantly surprised to see that it is actually an uber simple dish to make at home: the super-thin strips of beef don’t need to be marinated in advance, they only require shallow-frying, and everything that you need for the sauce can be picked up in even the smallest of supermarkets. 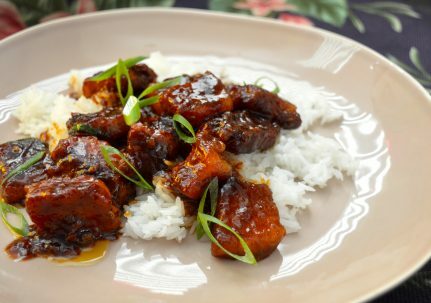 This recipe would work really well with pork too, and the entire thing can also be gluten free as long as you use GF soy sauce. Put all of the sauce ingredients into a saucepan, bring to a boil, then leave on a simmer to thicken whilst the beef is being cooked. 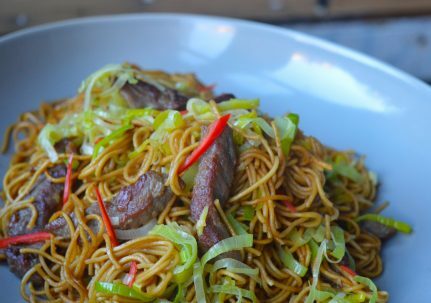 In a large oven tray or a bowl, toss the beef strips through the cornflour and salt. Use your hands and give the beef a few squeezes to make sure that the cornflour is tightly packed on. Heat the oil in a frying pan over a high heat, then add the beef and fry for a few minutes until golden and crispy. You may find it easier to do this in two batches, before returning the first batch to the pan. By now the sauce should have reduced down to a thick and glossy state that can coat the back of a wooden spoon. If it is still quite thin, turn up the heat and stir continuously to reduce it down. Pour the sauce over the beef strip and toss through to coat every bit of crispy beef. 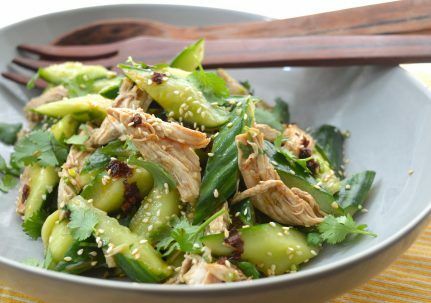 Sprinkle sesame seeds on top an serve with a garnish of cucumber, and lots of jasmine rice. OK. To market, to market to buy some some beef or pork. Home again to cook it. Except that it is almost midnight here. Have to wait till tomorrow to get the ingredients. Made it tonight for the family and it was delicious! Such a simple recipe, and quick to make! Hello, I tried the recipe, but I don’t know what I did, the sauce came out extremely sour and at the same time extremely sweet…. What to do? Thank you in advance. That’s great to hear Steph! 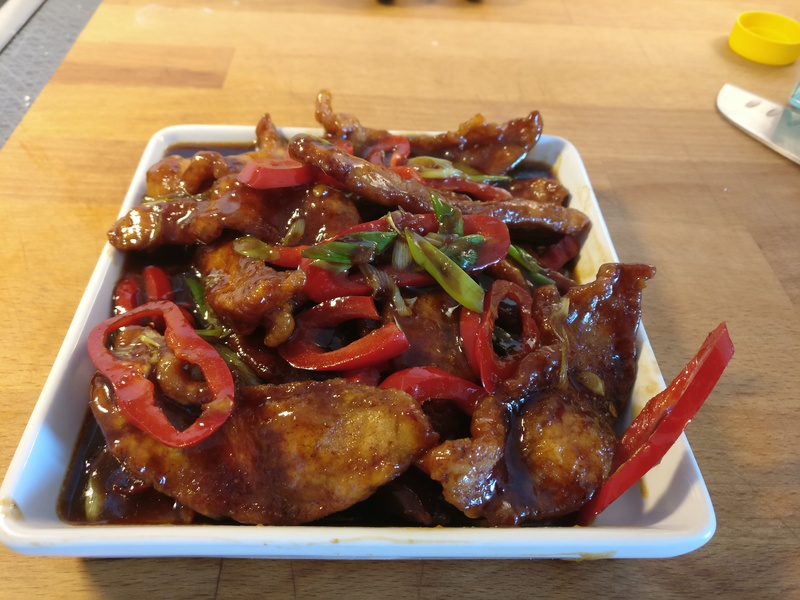 We find that the thickness of the sauce depends on the consistency of the sweet chilli and especially how much sugar is in it, as this helps to form the lacquer like sauce as it caramelises. Glad the cornflour save the day! This is a lovely recipe. It turned out soooooo delicious, my husband asks for it nearly every other week. 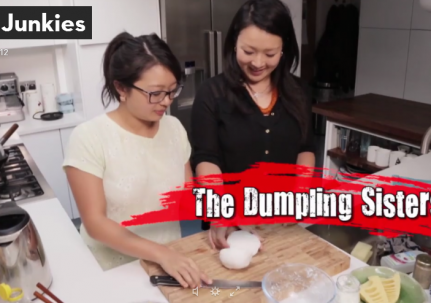 Another hit from the Dumpling Sisters! Wat an awesome recipe….the dish turned out crispy,juicy,tasty and lifted my mood instantly.took me just 15 mins to prepare …my 5yo couldn’t resist my expressions on eating it and also gave it a try n loved it!! Thank u …keep up the great work! Do you mean corn starch, which is what we have in the US? Or actual corn flour? I added a bit of potato starch to provide for a more random texture of the coating. Let’s see how it works out! Unfortunately it didn’t work out. Instead of going crispy the coating got soggy. Any idea what could’ve gone wrong? Delicious! We didn’t have light gluten free soy sauce so used half a tbsp of normal instead which was fine. Probably wouldn’t add the extra hot sauce next time as the sweet chilli sauce we have is already pretty hot. Best recipe we’ve found for this meal, we’ve tried a few others without any success. Thank you Amy and Julie for this wonderful recipe, it came out very well and the whole family enjoyed it!! Watched the video, looks amazing like my favorite dish, too looking forward to cooking this dish tomorrow. It is quite tasty.and I will make it again. In the video, what west-indian sauce did you use ?